Digitization help student to explore and study their academic courses online, as this gives them flexibility and scheduling their learning at their convenience. Kidsfront has prepared unique course material of ELEMENTARY MATHEMATICS Time And Speed for CDS Exam student. This free online ELEMENTARY MATHEMATICS study material for CDS Exam will help students in learning and doing practice on Time And Speed topic of CDS Exam ELEMENTARY MATHEMATICS. 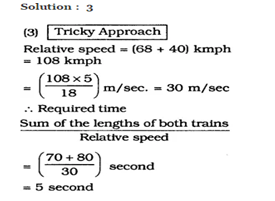 The study material on Time And Speed, help CDS Exam ELEMENTARY MATHEMATICS students to learn every aspect of Time And Speed and prepare themselves for exams by doing online test exercise for Time And Speed, as their study progresses in class. Kidsfront provide unique pattern of learning ELEMENTARY MATHEMATICS with free online comprehensive study material and loads of CDS Exam ELEMENTARY MATHEMATICS Time And Speed exercise prepared by the highly professionals team. Students can understand Time And Speed concept easily and consolidate their learning by doing practice test on Time And Speed regularly till they excel in ELEMENTARY MATHEMATICS Time And Speed. Shyam is travelling on his cycle and has calculated to reach the point`A` at 2 PM, if he travels at 10 kmph. He will reach there at 12 noon, if he travels at 15 kmph. At what speed must he travel to reach A at 1 PM? Solution Is : Total length of trains = 75 + 100 = 175 m Relative speed = 60 + 65 = 125 km/h 125 x 5/18 m/s Time taken = Total length/ Relative speed = 175 x 18/125x5 = 5.04s. 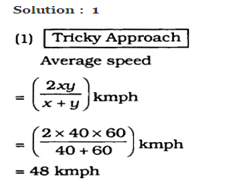 Solution Is : (A) Suppose Shyam covers the distance in x hours @ 10 km/hr so as to reach the point A by 2 P.M. Suppose, he covers the same distance in (x-2) hours @ 15 km/hr so as to reach the point A by 12 Noon. => Shyam starts his journey at 8 A.M and the length of the journey = 60 km. => So as to reach the point A at 1 PM, Shyam must travel @ 12 km/hr. Vivek is standing at a point "A" and walks North-east for 4 kilometres. He stops, faces South and walks till he can see point`A` exactly to his west. How far is he now from the point of A? Solution Is : (B) Vivek is 2?2 km from the point of A .
Azhar can complete a journey in 10 hours. He travels the first half of the journey at a speed of 21 km/h. and the balance at 24 km/h. Find the total distance in km? Ram and Rahim standing at a distance of 680 m run towards each other at a speed of 8 m/sec and 9 m/sec respectively. After how long will they meet? Solution Is : Ram and Rahim standing at a distance of 680 m run towards each other at a speed of 8 m/sec and 9 m/sec respectively Total speed at which they are approaching each other = 8 + 9 = 17 m/s Time taken = distance / speed = 680 / 17 = 40 s .
Two trains of lengths 70 m and 80 m are running at speeds of 68 km/hr and 40 km/hr rspectively on paralled tracks in opposite directions. In how many seconds will they pass each other ?